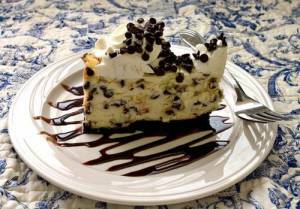 A wonderful Irish Cream Cheesecake for your St. Patirck's Day celebration. You can flavor the whipped cream topping with coffee or leave it plain. Either way, this "Luck o' the Irish" cheesecake is yummy yummy! Preheat oven to 325ºF (160ºC). Lightly grease a 10-inch (25cm) springform pan with butter. Combine crumbs and melted butter in a bowl, then press into bottom and 1 inch up the sides of pan. Bake until light brown, about 7 minutes. Leave oven on. Using an electric mixer or food processor fitted with a metal blade, beat cream cheese until smooth. Gradually incorporate sugar. Beat in eggs 1 at a time. Blend in Irish Cream Liqueur and vanilla. Stir together 1/2 cup chocolate chips and 1 teaspoon flour in small bowl; gently stir into cream cheese mixture. Pour batter into crust. Set aside the remaining chocolate chips for later. Place cheesecake in preheated oven and bake until puffed, center springs back, and golden brown, about 1 hour and 20 minutes. Cool cheesecake completely, then release sides of springform pan. When cheesecake is completely cool, whip the heavy cream and sugar together with an electric mixer. Add coffee extract (if using), and whip until firm peaks form. With pastry bag and decorative tip, pipe whipped cream around edges of cheesecake. Decorate top with the remaining chocolate chips. When ready to serve, if desired, drizzle a small amount of chocolate syrup on each plate, then place the slice of cheesecake over the sauce. Store any remaining cheesecake in the refrigerator. omg it was so good. if u haven't had any of this dessert then you're missing out. My name really IS the same as yours! I made this for a St Patrick's Day "cook-off" at work, and it won for "Best Overall Taste." Comments ranged from "WOW" to "You did NOT make this. It came from a bakery." Thanks for a fabulous recipe, and one that I'm adding to my permanent collection!